The safety of employees and customers is probably at the top of your list of winter concerns. Slippery conditions can cause falls and injuries. No one wants to see someone hurt, especially from something that could be avoided. Besides injury, lawsuits could follow and cost your business time and money. Sure, you could have your friend plow your lot, but that is no guarantee it would be done right. Also, consider potential damage untrained plowing might do. 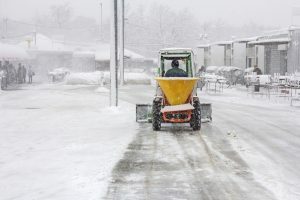 A professional snow removal company understands how to maintain and preserve the asphalt surface and is a lot less likely to gouge the surface with the plow’s blade. It is up to you but we are convinced that Fort Collins snow removal services are the smart and economical choice for your business. Depending on your needs, you might choose snow removal on a regular basis, the day snow arrives, or on a seasonal plan to save more money. Remember when winter makes its blustery entrance, you can keep the worst away by using professional, high quality and experienced snow removal from Advanced Landscaping & Sprinklers.